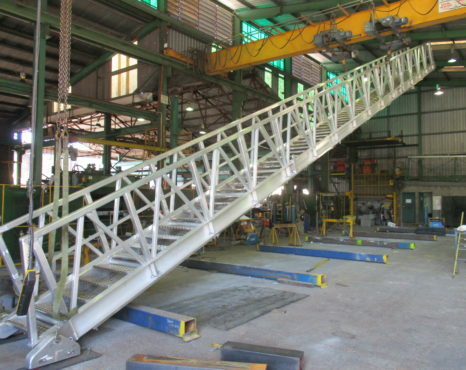 Scope of Work: To design and fabricate a 20-mtr set of aluminium correctable stairs for the disembarkation of Oil tankers at Townsville Wharf. DWW were engaged to design a method allowing staff to disembark vessels at the Townsville wharf, with a wharf width restriction of 20-mtr. The restricted width meant that a gang-plank couldn’t be used (max 30deg incline) so a set of self-correcting steps were design to operate at 45deg+ incline.